Mastercard’s fashion ‘do’ kicked off tonight with a colorful roar! We’re blogging to you semi-live (it’s finished) from the first entry in the 2008 Luxury Week at The Four Seasons Hotel in Central (we’re in the Blue Bar). Jean Paul Gaultier opens the week long festivities to a full house tonight. Jean Paul Gaultier’s animal themed show was if anything tongue-in-cheek, there was Michael Jackson’s Thriller soundtrack intermixed with plenty of wacky animal sounds. 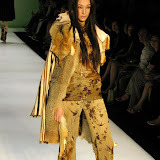 This is a collection that featured plenty of skin, literary in terms of every type of exotic animal print and type of fur, imaginable. It felt that he had just came from a bountiful hunt and this collection is a proud display of his spoils. Full body carcasses of animals with feet, tail and raw stripes of fur were left to dangle provocatively. Some of the celebrities spotted on the front row seats were Simon Yam, Wyman Wong, Jimmy Wong, Stefanie Sun and Myolie Wu and the ambassador of the event, Denise Keller who surprisingly was not on on stage to say a few words at the beginning, but instead decided to show her Mastercard TVC instead. But she was taller than we thought, even with the heels.